Whatever job you need done at home, it is important to find the right professional to do it for you. 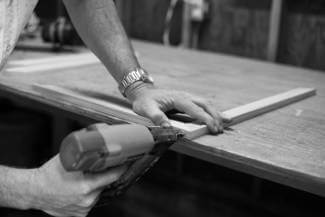 When it comes to carpentry, this need not be a difficult thing to do, you just need to know what to look for when looking for a carpenter. Certain things are the same as looking for a plumber or electrician – something most of us are more familiar with because we have used them more often – while others are specific to carpentry. To help you, we compiled the top five things to put on your list when getting quotes. As with any tradesman, if you can get a recommendation from someone you know and trust then that should be your first step. It doesn’t mean you don’t still have to do your own checks, but it does help to know they come recommended and if they have done work for friends you have probably seen it for yourself. Whether they are recommended or not, the next thing to do is to see what reviews they have from previous customers. Are they a member of a professional body? The main ones that carpenters are likely to join are the Institute of Carpenters, Federation of Master Builders, or the British Woodworking Federation. How considerate were they of their clients’ property – did they protect it and clean up after themselves, or make a mess and damage anything? While some may not necessarily hold a professional qualification, others might. They include NVQs or a City and Guilds Diploma. Not having one does not make them less good, but a qualification shows that they take their work seriously. You want someone with enough experience to do the job well, but who is still within your budget. When enquiring about this, you should also ask about what their specific experience is. If you are looking for someone to build furniture for you but their experience is mostly related to joinery or floor laying, then you are not getting the right level of expertise and experience for your job. Find out about what their specific skills and expertise are – keeping in mind that they may well be multi-skilled – and check that against their reputation for those types of jobs. Set a budget and get three quotes to compare. Make sure that each quote is clear in what the labour and materials costs are. Can they show you samples of materials so that you are clear on what you are getting and what you are paying for? Can they give you options to choose from? For example, you should not have to source timber, but you should have a choice on what is used in your home. Depending on the job you need a carpenter to do, there may be a need for other tradesmen to become involved such as electricians or plasterers. Does the carpenter have anyone they would recommend? They may be multi-skilled and be able to do certain other jobs themselves, but be clear on who is doing what and how it is built into your budget. and we would be happy to provide a quote or book in an appointment.